For use with Hillyard Connect portable dispensing unit. Green Seal certified. A fast acting, synthetic cleaner designed for daily floor cleaning that removes soil and leaves a shine. Neutral pH. Formulated to clean high gloss floor finishes without dulling. Neutral Floor Cleaner exhibits excellent cleaning efficiency in hard or soft water. 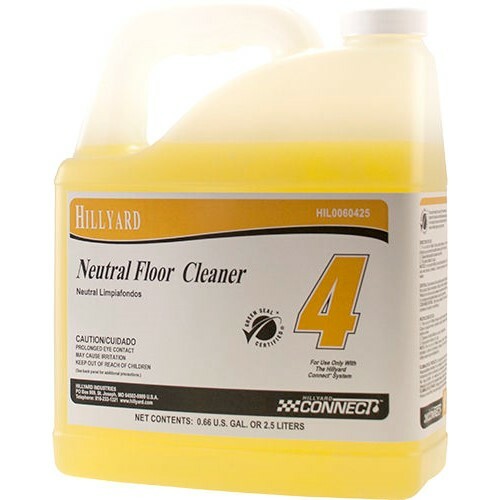 Neutral Floor Cleaner is phosphate free, plus it contains no soap, free alkali, or ammonia. Dilution rate 1 oz per gallon. Low foaming-in scrubber recovery tanks. Removes dirt without attacking the finish.